InStyler Review: Can You Really Style Your Hair in Half the Time? The InStyler takes two different tasks and combines them into one, with the idea being that you can save time and get a better look. If you’re used to spending time straitening your hair, and then styling it, they may have you in their sights as their target market. But can you really get good results from something like this, or are you going to spend just as much time fussing with your hair as before? To those of us born without naturally straight hair, a hair straightener is not an unfamiliar device. It can be a difficult, and sometimes dangerous tool to get your hair free from waves and curls. The process usually involves fully combing your hair, then straightening it, then using a curler on it to get the curls in the places you want. This is a lot of steps, and none of them are all that exciting, and using conventional methods can actually lead to a lot of frustration. InStyler says that it styles in half the time. That would be a pretty big feat and save a ton of hassle of getting ready. They say it has a 30 second heat up time, which would set it apart from other straighteners that can take several minutes to get hot enough to use. It also has multiple heat settings, which is really helpful when you’re trying not to fry your hair out any more than it needs to be. This uses ceramic, so it’s not made with cheap metals that can cause more damage to your hair. The hype is that they make it look really good in the commercials, enough to make you want to run out and buy it. But it’s good that you’re checking on whether or not it works, and not making an impulse purchase. The cost is pretty good as well, since it’s combining multiple products into one. They have a buy one get one free promotion going on so find a girl friend that wants to go in on it with you. It’s $155 for 2 of them shipped right to your door. The good part is that you only need to part with $35 of that up front so you can try it out for 2 weeks. If you don’t like it you don’t have to keep it, and if you do, they let you make monthly payments on the remainder. This should actually represent a decrease in your commitment level to getting your hair done. You’ll probably notice that it will take a lot less time to get ready for social events and going out on the town, which will make your husband or boyfriend really happy as he will no longer have to wait impatiently while you switch hairstyles yet again. One of the best methods is to brush it between layers, but you can figure out the way that works best for you. The really ingenious part of the device is the way that it rotates for you, so you don’t need a lot of fancy wrist action. It creates that great look of having the bottom tip of your hair curl in, and gives it that celebrity hairstyle look. It sounds a bit like a baby velociraptor when it’s doing its thing, but as long as it delivers with great hair you can put up with a little noise. As you can see from the demonstration, her hair looks a lot better at the end of the video than it does at the beginning of the video, which is proof enough that it works. She’s been using it for quite some time now, and has been really happy with it. She’s not the only one that thinks this works, and there are tons of reviews, most of which say that it does its job. Of course there are some that say it doesn’t work, but you can chalk that up to a difference in how people like to style their hair, different hair types, and whether or not they followed the directions. It would be sort of odd to see a product like this get 100% positive reviews, because there’s too much room for user error, and different hair types. 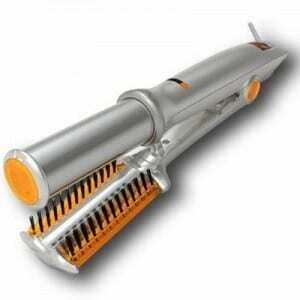 The kinds of products people use on their hair will also come into play when using a hairstyler like this one. The InStyler is getting our Thumbs Up. The reasons are that it has gotten positive reviews nearly across the board, it is set at an affordable price, and it makes it a whole lot easier to get ready. This is something that you can use every day to bring your best look to the table, or something that you reserve for special occasions. We recommend getting the InStyler because they’ve definitely cracked the code as far as reducing the time it takes to make your hair look good. You might not get the exact sort of results as our reviewer did, because there’s all sorts of different hair types. It might not work well for you or you could even end up liking it more than she did, but it’s definitely worth trying out. What do you think? Does InStyler work or not? Hey thanks for this awesome review… really enjoyed the video which helps. Nothing like seeing the instyler in action. Looks like it works, wouldn’t mind reading some more reviews – anyone here have experience using this??? Would luv to know more. If it works, this will definitely save me time and money as I’m always fussing over my hair. Based on what I see on your video I like the instyler very much, but unfortunately I haven’t found a friend yet who needs one so that I can take advantage of the buy one get one free deal. I guess what I could do is to try it out for 2 weeks and return it if I don’t like it, but that still feels so much like waste when you have 1 for 2 deal. Anyways thanks for the review. Please continue posting video reviews because they’re very helpful. I have proabably owned at least a dozen electric hair tools in my entire life but when the InStyler came out I really wanted to try it! I am so glad I came across this page so, like Josiek, I could see it in action. I love the idea of having a tool that is made of good materials and will actually work. I years of heat damage I have put on my hair is almost shameful and I don’t want to add even more damage with another product. Now all I need to do is find a friend who would be willing to split the cost with me! My mom bought the InStyler and passed it to me. Her hair is so thin it just wouldn’t work so I got it. I plugged it in and you have to really watch out because I was burned immediately. There isn’t a safe way to hold it without being burned. Needless to say, I have passed it to my niece. She said she uses a pot holder to hold one end of it because she had the same problem I did. She was burned right off the bat as well. It cost my mom $100.00 so you don’t want to throw it away. That is why it has been passed through our family. It gets hot and it works, but I’m not risking a burn.